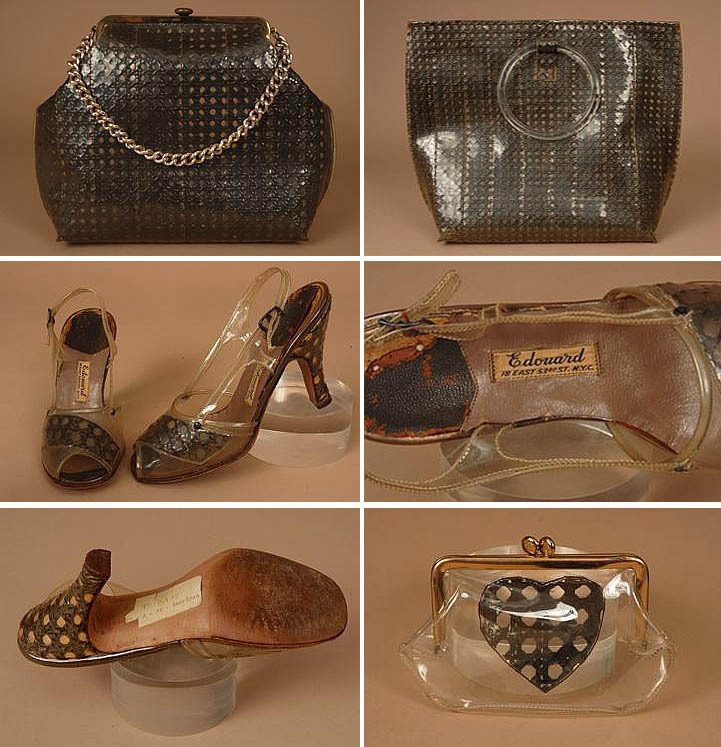 A handbag of imitation black patent crocodile skin, with gilt metal shoulder straps and clear plastic change purse. 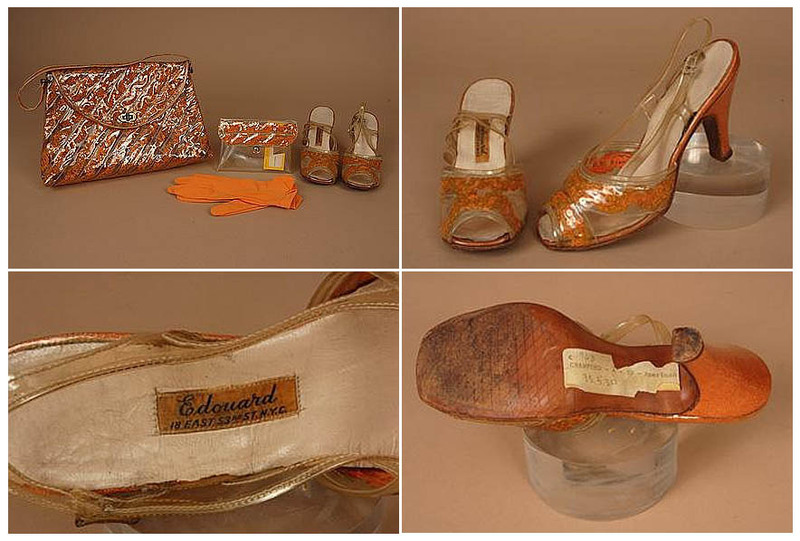 ​A pair of matching slingbacked peeptoe shoes, labelled Edouard, 18 East 53rd St. N.Y.C. 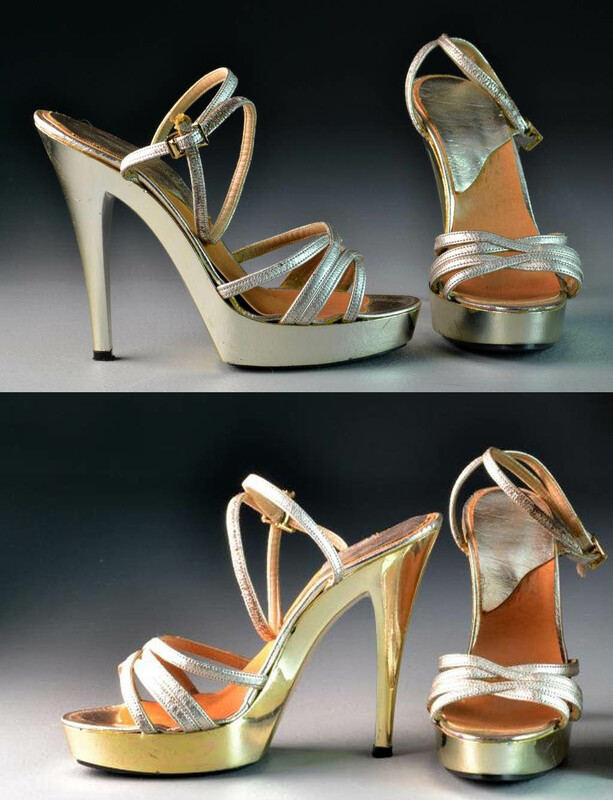 A pair of silver ankle strap sandal pumps, size six. 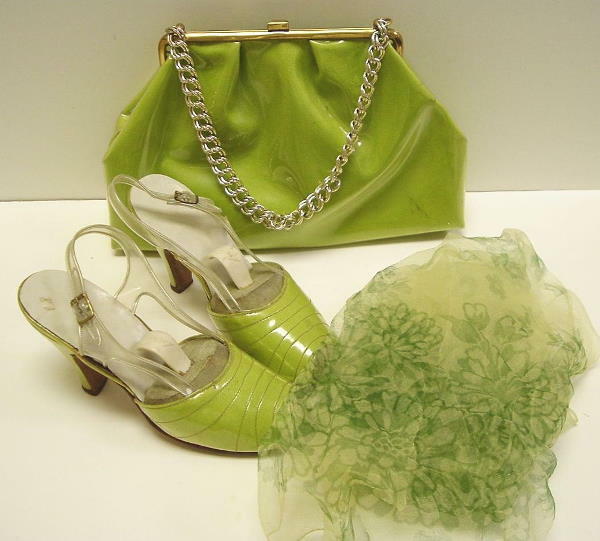 A pair of lime green vinyl dress shoes and purse from Crawford's personal collection. Appears to be made by Leach-Kale. Slingback straps are made of clear vinyl. Accompanied by a green on green print chiffon scarf. ​All three are made out of plastic covered fabric. Slingback straps on shoes made of clear plastic. Summer handbag & shoe set having dark brown cane laminated between clear vinyl. 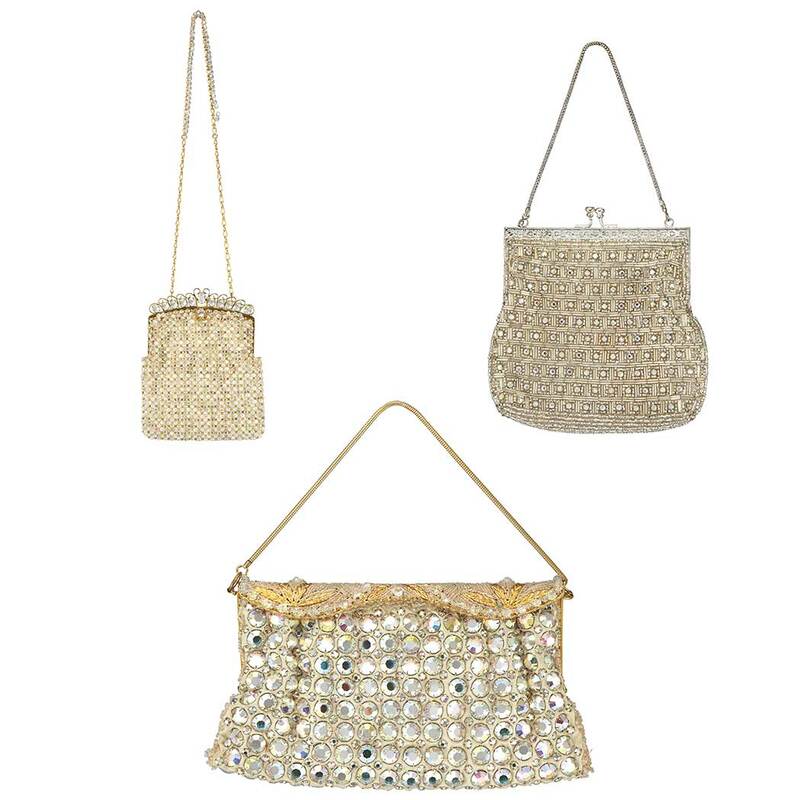 ​Change purse; handbag with chain handles, 15" x 12"; tote bag with lucite handles, 19" x 16". O​pen toe sling-back shoes by Edouard, approx. size 5, L-9.25", Wd-3", heel 3"
​ Crawford had previously given the set to the New York museum. 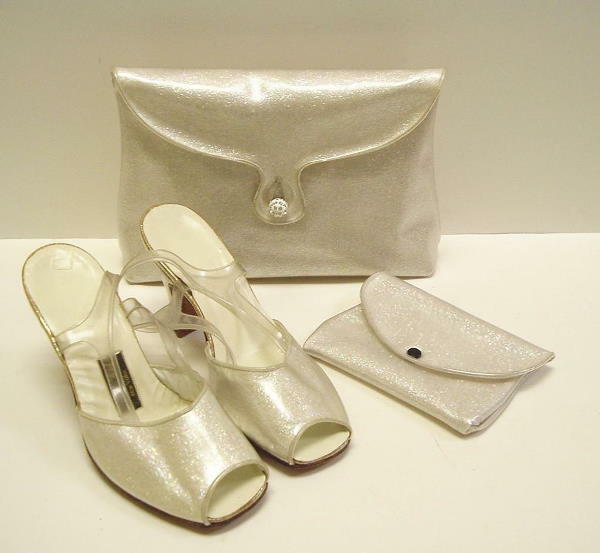 Summer handbag & shoe set having orange sequins laminated between clear vinyl. H​andbag with self same handle, 16" x 8"; change purse; open toe sling-back shoes by Edouard, approx. size 5, L-9.25", Wd-3", heel 3". ​Crawford had previously given the set to the New York museum. Including one Delill example, each densely decorated with sparkling embellishments. 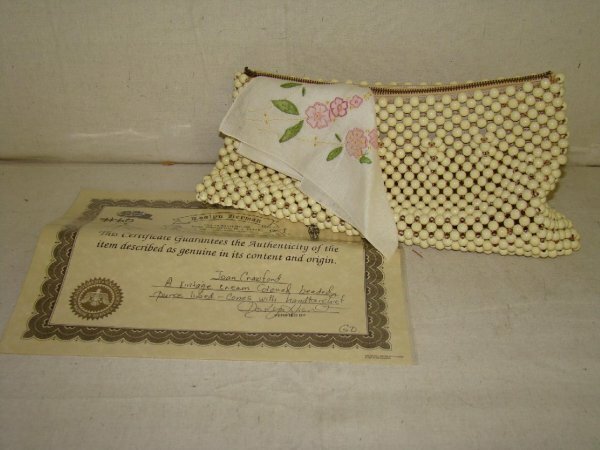 These handbags sold at auction on December 7th, 2011. L​ined. With one of Joan's handkerchiefs.